The classic Ricoh GRII compact camera is to get a major update next year. The development of the GRIII, announced at Photokina 2018, will increase resolution to 24 megapixels, add in-body image stabilisation, and fixed touchscreen LCD display. Video quality remains unimproved however, with no 4K capability. Unlike the current Ricoh GRII, the new GRIII will not have a pop-up flash. However the hotshoe has been updated to allow TTL compatibility with Pentax flashguns. The lens is a fixed 18.3mm, which with its APS-C sensor, gives an angle of view equivalent to a traditional 28mm wide-angle. The camera offers a full range of metering and exposure modes, and uses a hybrid autofocus system. The camera has a built-in ND filter. The full ISO range of the camera has yet to be announced. The Ricoh GR has an impressive heritage, dating back to the first GR1 which was launched over 20 years ago in 1996. Back then, the camera shot film – but the discrete high-quality camera with a fixed non-zoom wide-angle lens soon became a firm favourite amongst serious photographers who wanted a camera they could keep in their coat pocket for occasions they didn't want to carry a bulkier system camera. The first digital version of the camera, the Ricoh GR Digital, was born nine years later in 2005. 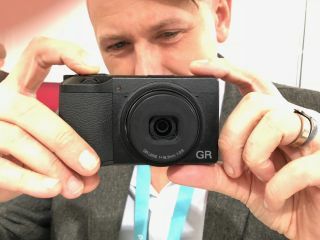 The GR II is, despite the name, the seventh generation of this digital compact – and will eventually replace the Ricoh II which was launched back in 2015. The Ricoh GRIII is scheduled to go on sale early in 2019. The price has yet to be announced, but is expected to be under €1,000.